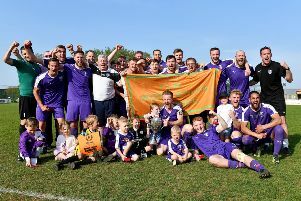 Daventry Drayton Grange moved back to the top of the Daventry & District Veterans Sunday League, with a hard fought 2-1 win over a Prince of Wales team that were determined to gain revenge for an earlier season defeat by Grange. After a scoreless first half with chances for both teams, Grange grabbed the lead courtesy of a controlled two-yard finish from Richard O’ Malley. Further pressure led to Pete Aldridge heading home a Baz Mistry cross to give Grange a deserved 2-0 lead. The well organised Grange defence was well on top of the direct football being played by Prince of Wales. A late lapse led to the Prince Of Wales goal but Grange held out comfortably for a well merited win. A good all round performance with all players doing their bit and well refereed by Andy Humphries.